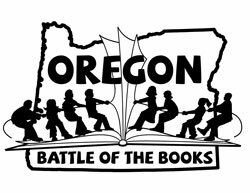 The Oregon Battle of the Books (OBOB) is a statewide reading competition for children in grades 3-12. The program is sponsored by the Oregon Association of School Libraries. Students read from the year’s book list for their grade level and discuss the titles in teams. Each team prepares to answer trivia questions about the books. Teams compete against other teams of students in a tournament-style “battle” of knowledge about the books. Students who win battles at their school can advance to regional and state-level competitions. Mr. Janssen at Grandhaven Elementary (McMinnville, OR) takes us through what to expect at a battle. What are the books for this year? Below are lists of this year’s OBOB titles in different formats. Note that not all titles are available in every format. See tips on using OverDrive for parents and educators. What resources do you have to help me? The Cedar Mill Library OBOB page has lists of sample questions and other resources. The Ainsworth School's OBOB page has lists of sample questions. The Newberg Public Library OBOB page has lists of sample questions. OBOB is paid for by local school libraries, local public libraries, and federal Library Services and Technology Act funds administered by the State Library of Oregon.